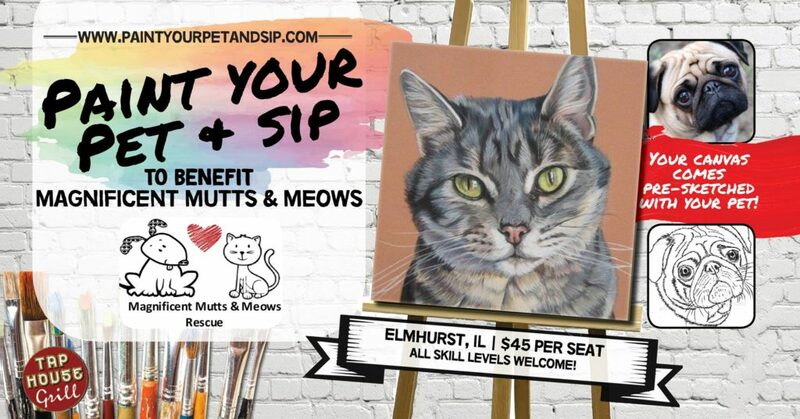 Come Paint your pet and sip with us. Aided by our fun-loving instructors, create an original masterpiece of your pet, all while enjoying food and drinks! For this class, we are donating a portion of every ticket to Magnificent Mutts & Meows Rescue. Whether you have a cat, dog, bird, or lizard- come join us as we paint masterpieces of our pets while supporting a great cause. One pet per canvas. All skill levels are welcome! 1. A pre-sketched canvas of your pet if you email us a photo of your pet AT LEAST 2 days before class. Magnificent Mutts & Meows Rescue is a non-for-profit, 501(c)3, licensed animal shelter dedicated to caring for and finding loving homes for any breed of dog abandoned, abused, neglected or in need of assistance for any reason. Once you have purchased your ticket, please email one ‘clear’ photo of your pet and a copy of your ticket to paintyourpetandsiprsvp@gmail.com. Head shot or face photos will work best. Please include any names of guests you’d like to sit with during class. -We take RSVP’s up to 48 hours before the class.